AddFreeStats web analytics tool provides free website statistics and help you to gain more readers on your Tumblr blog. Who visit your blog? What people read on your blog? How they found your blog? Analytic data provided by AddFreeStats answer to those questions! AddFreeStats is a powerful tool for analyzing and tracking reader behavior. < AddFreeStats is designed to integrate and work well with Tumblr blogs better than any other web analytics tool. Installing the web analytics tool is also very easy and takes just a few minutes to get it fully functioning. 1)	First you need to create an account on AddFreeStats. 2)	Then you need to copy the unique tracking code provided by AddFreeStats. 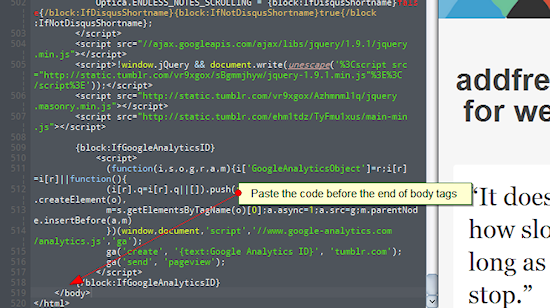 3)	Next you should log into your Tumblr blog and then click on the site name that you want to install AddFreeStats on. 4)	Next, click on "customize" beside the dashboard tab on top. 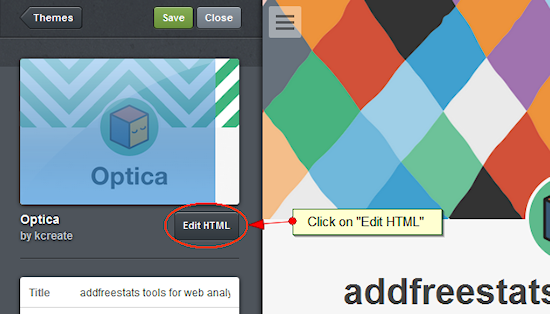 5)	After that, a new window opens and you should go to the tab labeled "Edit HTML". 7) To save the updates done to the code, click on "update preview" tab that is on the top right of the page then click on "Save". 8)	To finish the integration click on "Appearance" and then "Close". The Addfreestats is that easy to install on your Tumblr blog and should just take less than five minutes. After this AddFreeStats will now start functioning. You can access the analysis by clicking on the AddFreeStats button that appears on your blog. To get more detailed analysis and traffic information, log into your AddFreeStats Analytics account.